The Concise Encyclopedia of the Mechanical Properties of Materials draws its material from the award-winning Encyclopedia of Materials: Science and Technology, and includes updates and revisions not available in the original set. Mechanical properties describe the response of a material to an applied strain. Elastic behaviour is encountered at small strains, followed by plastic strain which is usually followed by fracture. If the magnitude of the applied strain fluctuates with time, fatigue failure may take place. Again, at relatively high temperatures (with respect to their melting point) materials subjected to a constant stress may exhibit progressive creep deformation over a period of time which may lead to ultimate failure. Articles have been selected which discuss this wide range of properties, both generally and also specifically with reference to metals and alloys, polymeric materials, ceramics and glasses, composite materials, as well as some miscellaneous materials such as wood, paper and textiles. The majority of contributions contain quantitative data, the others are predominantly descriptive in nature where it is more appropriate for the type of material in question. 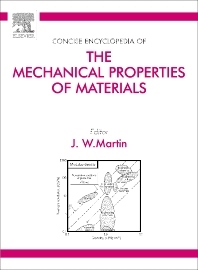 The compilation provides the reader with an up-to-date understanding of the mechanical properties of a wide range of materials. Faculty and postgraduate research students in materials science and technology and related disciplines, especially physics, chemistry, engineering and biomedical science; also researchers and staff in government and industry.